On November 7, 2015 the collection of disc phonograph records listed in this index below was delivered to the Center for Mallet Percussion Research at Kutztown University, c/o the Kutztown University Foundation located at 15200 Kutztown Road, Kutztown, PA 19530. 1) 13 boxes containing about 1000 acoustic disc records featuring performances on a xylophone that were manufactured between 1890 and 1935. Each box was numbered and the disc records inside were arranged in numerical order to correspond with the identifying numbers in this Archive index. 2) one master digital copy (16MB USB flash drive) containing 1280 titles transferred from the acoustic disc records in the Archive to digital audio files. 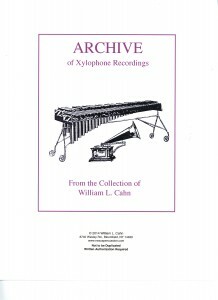 3) one book/CD: 284-page discography, The Xylophone In AcousticRecordings – 1877 to 1929 by William L. Cahn. c) by Song Title CLICK HERE lndex #3 by Song Title . 2) KU will store and preserve the Archive in its entirety under storage conditions that are most favorable for its preservation until the Archive is sold, donated or otherwise transferred to another owner by KU. 3) KU will maintain the Archive in its entirety, and not divide the Archive for any purpose for as long as KU is the owner. 4) KU will make the Archive available and accessible to the general public as may be practicable, but in no case more than 30-days after receiving a request in writing. 5) KU will insure that properly maintained playback equipment, and instructions for the proper use of the equipment and the proper handling of disc records are made available to anyone who wishes to hear any of the recordings in the Archive. 6) KU has agreed that the master digital version of the Archive (and any of the individual titles included therein) will only be used for listening, and that the master digital version of the Archive (and any of the individual titles included therein) will not be permitted to be copied or otherwise transferred to any other medium.